Identification: Glossostigma cleistanthum is characterized as unusual, bright green patches developing on muddy substrates of littoral zones in full sun. 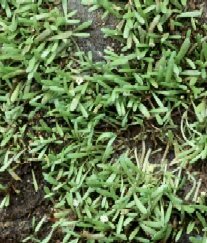 It's tiny leaves arise from creeping stems that grow horizontally just below the soil surface and root along the nodes. Leaves are paired and spatulate-shaped (having linear bases with broadened tips). Plants are found both submerged and emergent. Where growing submerged, leaves of G. cleistanthum range between 07-5.7 cm long and bear closed, self-fertilizing flowers, called cleistogams that are nearly sessile (Les et al. 2006). Where the water recedes in summer months, leaves are much smaller (0.5 - 1.1 cm long) and produce insect pollinated chasmogamous flowers (Les et al. 2006) borne on short stalks. Seeds, produced in capsules, are present in U.S. populations and probably contribute to the rapid rate of spread once G. cleistanthum is introduced to a waterbody. The introduced Glossostigma cleistanthum closely resembles our native Limosella (mudwort) species and may also be confused with emergent leaf forms of some members of Utricularia (bladderwort). Table 1. States with nonindigenous occurrences, the earliest and latest observations in each state, and the tally and names of HUCs with observations†. Names and dates are hyperlinked to their relevant specimen records. The list of references for all nonindigenous occurrences of Glossostigma cleistanthum are found here. Ecology: Grows submerged and emerged along sandy to muddy shorelines. Favors oligotrophic conditions - low pH, alkalinity, conductivity, phosphorous and where water clarity is high, it will grow up to 4 meters deep. Means of Introduction: Initial introduction probably by aquarium release; subsequent movement to new waterbodies may occur with migrating geese or other waterfowl. Status: Spreading rapidly in the Mid-Atlantic region. Remarks: Previously erroneously identified as Glossostigma diandrum, but molecular analysis has confirmed 14 of the 19 known populations to be G. cleistanthum (Les et al. 2006). Les, D. H., R. S. Capers, and N. P. Tippery. 2006. Introduction of Glossostigma (Phrymaceae) to North America: a taxonomic and ecological overview. American Journal of Botany 93(6): 927-939. Cook, C.D.K. 1996. Aquatic plant book. SPB Academic Publishing b.v., Amsterdam, Netherlands.